Louis J. Bader House. From Wikipedia. Image by Werewombat, 19 Feb 2010. In 1922 an elegant Tudor hou.se was built for Mr. and Mrs. Louis Bader. Designed by the Portland firm of DeYoung and Roald, Architects, the house is located at 3604 S.E. Oak Street in Portland, Oregon. The Bader Houge is a superb example of a finely Grafted Tudor home. The front lawn sweeps upward from the street to the decorative half-timber and stucco clad building. The house faces north across Oak Street to the trees of Laurelhurst Park, and is flanked by fine homes representing diverse styles. The interior of the house is luxurious in its extensive use of rich oak and mahogany, Italian tile and marble, its massive fireplaces, and its ornate fixtures. The house also has one of the region's earliest built-in vacuum systems. There have been no exterior and very minor interior alterations to the single family home. Front Facade (NortM: The front of the Bader House is highlighted by a finely Grafted entry porch, centered on the main wing, and by a small rectangular salient set above the porch. A handsome walkway made from imported English bricks set in a herringbone pattern parallels the driveway, then runs along the front of the house to the entrance; a narrow walk continues to the side of the house. A striking gabled salient rises to the west of the entry. The upper floors of the gable are elaborately half-timbered, in the distinctive Tudor style. The main roof is hipped and centered above the entrance porch. A massive, brick-faced, chimney rises from the west side of the main wing to an elevation slightly above the ridge line of the main roof. The large chimney marks another classic element of the Tudor style.The entry porch projects dramatically from the front of the house. Its flat, parapeted, roof is supported by three clustered square columns at each outside corner, placed so that when viewed from front or side, they appear as pairs of columns. They are decorated at their capitals with elaborate scroll-like braces. The pairs of columns are connected by slightly curved Tudor arches serving as decorative lintels. The porch's parapet is decorated with quatrefoil cutouts, similar in style to designs used during the Tudor period. Directly over the porch is a small, rectangular bay holding a double window with leaded, diamond-shaped panes. Beneath the window is a masonry window box, supported by heavy wooden brackets. The door is heavy quarter-sawn oak, with an elegant tripartate window in its upper portion. The window has leaded, diamond-shaped panes, with beveled edges. The door is flanked by narrow windows matching those of the door itself in style and placement. A screen door for this entrance, made of quarter-sawn oak with copper screening, has been found in the basement and will be restored. The entry is flanked on the first floor by tripartate leaded windows. Those to the east are 4 over 12, with a brick sill. The use of brick to highlight features of the house is characteristic of Tudor styling. All of the windows in the house have wooden sashs and white metal leaded glass, unless otherwise noted. The first floor windows west of the porch have a central section 7 over 21, while its side sections are 3 over 9. The sill beneath this casement is also brick. The end windows of both tripartate units are casement windows. On the second floor above the east windows, are a pair of double-hung windows, 8 over 8. Rising above the west windows is a dramatic architectural feature, containing a false salient and a steep gable with curvilinear cut bargeboards. Overhanging second stories are characteristic of the Tudor style, and examples of these can be found in the Bader House. In fact, however, the front salient and its gable project only a short distance from the main wall, and the architect's skillful design uses a boxed lower edge with supporting brackets, and the upward sweep of decorative half-timbers, to give the illusion of a structurally significant overhang. The second floor of this unit holds a tripartate window; each section has 16 panes. The side windows open as casements, and the center is fixed. Above thesewindows, just below the peak of the gable, is a small 6 paned attic window. this style are characteristic of Tudor houses. A first floor sun room, and its French doors, is visible through the open colonade of the porch. Above the sun room is a second floor sewing room with three large 16 paned windows: the end windows open as casements. A small hipped roof gable rises above the sewing room and joins the main roof to the east. the house, is the columned porch with the wall of the main building rising behind it. The west wall of the sun room has three high, multi-paned windows; the center window is 22 over 44, while the flanking windows are 10 over 20. Only an awning window at the top, north end of the room opens. The wall under the windows is clad in wood. The sewing room has four leaded, 20-paned, windows; the two windows at the center open as casements, while those at the end are fixed. The windows of both the sun room and the sewing room are shaded by striped awnings that match those originally on the house. The side of the porch has three pairs of columns, similar to the front porch. The porch floor is made of small Italian tiles, layed in a herringbone pattern. French doors exit the living room to the porch. Above the flat roofed porch is the half-timbered second floor of the main wing, with two double-hung windows, 8 over 8. The brick faced chimney rises against the main wall, centered between the porch and the sun room. The covered porch and the sun room wing with its high windows are elegantly Tudor in style. Visable to the rear of the main unit is the stuccoed west wall of the small southeast wing, set back 38 feet from the end of the west extension. On its first floor are a wooden doublehung window near the inside wall, and a larger 9 paned woodenwindow near the outer corner. The second floor has a single double-hung wooden window with a striped awning. A small brick faced chimney rises through the hipped roof gable. protected by awnings. Further to the west is the extension forming the sun room and sewing room with their large windows. wooden double-hung windows, protected by an awning. lower sections that swing open as casement windows. The large, fixed, central window is 7 over 21. This bay, and the salient above it, are typical features of classic Tudor houses. The bay is flanked to the south by a pair of wooden double-hung windows, and a rear door recessed into a small arch. North of the bay are large casement enclosed tripartate windows; all are fixed and have 12 panes. The sill under the casement is brick. The second floor salient has a pair of wooden double-hung windows. It is flanked on the wall to the south by a similar unit, and to the north by a pair of double-hung windows, 8 over 8. A small dormer with a design similar to the dormer at the back of the house, is set in the main roof, just to the north of the twostory bay. The chimneys, and the front gable, rise above the roof lines. symetrical lines are bisected by converging flower beds and marble steps that lead to the garden's rear terrace. The entire garden is bordered by flower beds with perrenials, and by various decorative bushes and trees. Two thirds of the way between the house and the steps is an elegant stone fountain set in a square pool, that is original to the house. Two marble steps risebehind the fountain to the terrace of the upper lawn. Flanking the steps are large stone urns, and narrow flower beds. The present urns replace the original pair removed by a previous owner, but closely match the originals visible in historic photographs. A wide path of pink Italian marble runs south some eight feet, splits into a circle that encloses a large flower bed, then joins again to lead to a small marble platform at the back of the property. The platform holds a teak bench protected by a columned roof. The garden gains privacy from a western border of arborvitae; a southern border marked by a hedge of holly, placed behind the marble platform; and an eastern border marked by the garage, a long pergola with hexagonal concrete corner posts crossed by heavy timbers, a variety of bushes, and a tall coniferous bush. A small patio west of the fountain is shaded by a tall cedar. A second pergola links the house and garden, sitting with its southern corner posts close to the end of the house's small wing, and extending into the garden. The corner posts are similar to those of the first pergola. Wood timbers atop the posts form a heavy trellis supporting a decorative grape vine. The paving under the pergola is of Italian marble, and the vines of a decorative grape twists over the frame. The grape is an original planting, and in the summer its leaves are brilliant red. The garden brings a sense of ordered peace, and provides a refuge from the city. the center by long halls set on axes from the main entrance to the back door. On all levels, this hall contains a staircase. billiards extension. The finished central hall holds the stairs. Behind the stairs is the vaccum equipment built into the house. The pump is marked "Spencer Turbine Company / Hartford Conn. USA / Vaccum Cleaning Equipment". The main vaccum units are in working order, and the entire system is being reactivated. The system marked an important technological development for this region. The western section of the basement is divided into a series of unfinished work and utility rooms. This part of the basement houses the original oil-fired boiler from the United States Radiator Corporation that still provides heat to the individual hot water room radiators. Gas has been restored for cooking and to fuel the domestic water heater. from the Baker & English Company of Portland (later called Baker Company, Specialties). Except for the basement, kitchen and bathrooms, all floors of the first, second and third levels are 1 1/2" oak. The oak paneling, window and door frames, and other detailing throughout the house is quarter-sawn oak. The tile and stone floors in the building are of Italian tile or marble. front and back of the room, and through the French doors leading to the covered porch. Two ornate bronze light fixtures hang from the ceiling, each with six graceful, swan-necked brackets. Sconces are set around the room. A high, dark, moulding protects the base of the walls, and picture moulding circles the room several inches from the coved ceiling. Quarter-sawn oak frames the windows and doors. A large fireplace with a shellpattern frieze, carved of sandstone from the Hillsboro area and made by the Blaesing Granite Company of Portland, Oregon, dominates the west wall. The carved granite mantel and scroll brackets of the fireplace have the elegance of a traditional Tudor fireplace. The fireplace is flanked by French doors leading to the covered porch to the north and the sun room to the south. The north and south window casements are spanned by heavy wood curtain rods, carved in a spiral pattern, that are orignial to the house. The original living room curtains, from Liberty of London Fabrics, are available, and will be restored to the room.The sun room has a small Italian tile fireplace set against the north inside corner of the room. Leaded windows fill most of the west and south walls, while French doors open to the side porch. The oak window frames blend with a golden covering on the coved ceiling and the walls. The wallcovering is gold leaf applied over burlap. (3) Dark Italian tiles cover the floor, and a bronze light fixture hangs from the ceiling. The warmth of wood and wallcovering reflect luxury and the finest craftsmanship. The adjoining side porch has a floor of small Italian tile set in a herringbone pattern alternating dark brown and medium brown tiles, and having a decorated border. An original, hexagonal, light fixture is mounted on the ceiling, while a long swing hangs from original ceiling hooks. East of the main entrance is the dining room, with window and door frames, and half paneling, of rich mahogany. The room is entered through wide accordion-style French doors. A small, decorative, tile fireplace occupies the outside-rear corner of the room. (This is the only non-working fireplace in the house. )The top of the mahogany mantle holds a hidden storage compartment. The room measures some seventeen by fifteen feet. An original, ornate, bronze chandelier hangs from the center of the coved ceiling. A call button on the floor under the table was used to summon an attendant. A small hallway, with a pantry and breakfast room, separate the dining room from the kitchen. The original cabinets of the pantry have glass doors and white painted frames. The breakfast room occupies the semi-hexagonal bay window, and is separated from the hall by a glass and wood framed arch. The multi-paned windows of the bay flood the small chamber with light. toilet, are original. A laundry chute leads to the basement. An original ceiling fixture and sconce light the rear vestibule. unit. In a feature unique to these windows in the house, the cross joints of the leading are embossed with fleurs-de-lis. These decorations were taken from the original windows after the fire. house while pairs of double-hung windows open over the covered porch to the west and over the back garden. A fireplace of Italian tile, with a wooden mantle, is centered on the west wall of the room. The tile of the hearth has been replaced, but with a style that matches the original. An alcove overlooking the formal garden has picture molding window seats that hide storage cabinets. The original bedroom light fixtures were removed by a previous owner. The sewing room is attached to the rear of the west wall. The high windows of the small room take up much of its wall space. which were found in the basement and restored. The ceiling fixture is a replacement.The east side of the second floor has bedrooms at the north and south, with a small study between them. The most distinctive of the three rooms is the study. It is entered from the back bedroom or by an arched hall leading from the main hall. The original light fixture in the study is silver plated, and matched a silver-leaf wallcovering (applied with the same technique as the gold leaf in the sun room) that once covered the room. The silver covering was replaced by a previous owner. The study has built-in bookcases and a window seat, in addition to painted wainscotting. There is a laundry chute in the hall. bath was removed, and replaced with a corner cabinet and shelf. (4) The kitchen was remodeled after the fire described above. Other minor alterations include the replacement by a previous owner of the rear dormer windows with a sliding aluminum window. The current owners intend to restore this window to its original appearance. In addition, the wooden shingles of the roof were replaced with composition shingles. Finally, baseboard electric heaters have been added to the unheated ballroom. The only alterations to the garden, besides the growth of shrubs and rotation of flowers, are the replacement of the original urns, removed by a previous owner; and the extension of the arborvitae, on the west side of the property, from the rear of the house to the southern boundary of the garden. The Louis J. Bader House on SE Oak Street at 37th Avenue in Portland, Oregon faces north onto Laurelhurst Park, a central feature of the Laurelhurst district, one of the city's earliest and most fashionable planned residential park developments. Laurelhurst was laid out in 1909 by the Ladd Estate Company on the historic Hazelfern Farm property held by William M. Ladd. The subdivision was a pace-setter, locally, in the park, parkway and residential community movement so heavily influenced by the work of Frederick Law Olmsted. In fact, Laurelhurst Park, the focal point of the development, was designed by Olmsted's successors under contract to the City of Portland. The Bader House was among the later houses to complete development of the subdivision. It was built in 1923 from plans in the English Cottage style by the firm of DeYoung and Roald. Louis Bader, a lumberman from Illinois, arrived in Portland in 1910. By the time he commissioned his house fronting Laurelhurst Park, he had ventured successfully into real estate marketing. He financed a number of the houses in the development. He resided in the house on SE Oak Street until 1936.
doors of the 1920s, being composed of hinged vertical tongue and groove panels in stiles and rails with diagonal bracing and multipane glazing. That it was designed in concert with the house and garden is evident from its finish details and the secondary pergola which makes a gateway or transition feature at its front. Because it is an aspect of the property's historical architectural theme, it is counted as a separately contributing feature. The garden, on the other hand, will not count as a separately contributing feature until it can be more fully evaluated in the context of early 20th Century landscape gardening locally. Even at present, however, it is clear that the garden is well preserved in its original plan and in the general outline of its planting key. 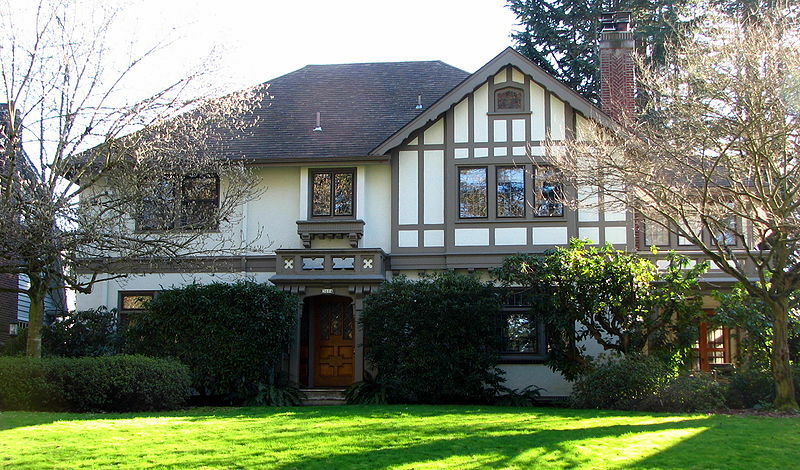 It is an integral part of the "garden suburb" which Laurelhurst developers cultivated. The rear garden was laid out by George Otten in the formal Italian tradition with two distinct terraced compartments linked by a strong central axis created by alignment of a sundial, flagstone concourse and steps, and a circular bed. A classical pergola terminates the garden view from the house and gives the garden an illusion of depth on a lot no more than 75 x 170 feet in area. George Otten was the long-time landscape engineer for the Oregon State Highway Commission and participated in landscaping the mall in the course of the State Capitol Reconstruction Project, 1936-1939. The Bader House was highly ranked in the City of Portland Historic Resources Inventory of 1983-1984. Comparative analysis of houses in the Laurelhurst district indicates there is only one other in the subdivision which represents high style Arts and Crafts, or English Cottage architecture in the Tudor vein as well. It is the house of John Dodson at 3641 ME Couch Street, designed by De Young and Roald and built four years later than the nominated property (1927). The Bader House has superior status in its stylistic category on the basis of its developed landscape, its craftsmanship and quality of materials. The New Heathman Hotel in Portland, a National Register property, is among the best known works by the firm of James DeYoung and Knud Roald. partnership, they created over ten Portland buildings now listed on the City of Portland Historic Resource Inventory. The Bader house was one of their earliest residential commissions. The Tudor styled Bader home quickly became a distinctive landmark in the Laurelhurst neighborhood. Laurelhurst was an elegant neighborhood when Louis Bader chose it as the site for his new home: it remains so today. well planned residential community whose homeowners were required to meet community planning criteria. Each home had to cost at least $3,500, and the developers paid attention to the creation of a harmonious park like setting for these homes. family were members of the St. James Lutheran Church in downtown Portland. The family's parties were held in the garden and the large basement room. When Edith Bader married in 1931, she decended the main staircase to the ceremony held in the living room. Louis Bader died in 1950.
owners, Roberta Siegel and Nathan Sanders, in 1987.
window casements framing leaded windows, some with brick sills. DeYoung and Roald used decorative, non-structural, halftimbers, a feature typical of Tudor houses, and of stucco cladding, in designing the home. They included extensive, heavy, detailing in their design. The tall, multi-paned leaded windows, set in heavy wooden frames, are common in Tudor homes, as are brick sills and heavy brackets supporting overhanging bays. All are present on the Bader House. Also important in Tudor architecture are massive chimneys, usually of brick or stone, and the large main chimney of the Bader House gives focus and balance to the home. It is further typical of Tudor chimneys as it serves several fireplaces. Tudor homes. The elegance of the porch is increased by the second floor bay window that carries the porch's lines upward. To the west, the lines of the front facade sweep upward to the gable, and the overhanging second floor of the gable's salient. The front gable, and the overhanging half-timbered salient, are typical of Tudor buildings. Overhanging salients and bays are also present on the south (rear) and east facades. The two-story bay on the east side is particularly elegant, combining the first floor semi-hexagonal bay window with the second floor rectangular salient. by its brick window sills, wood panels on the sun room, and wood brackets on the porches and under the second floor bays, the Bader House is typical of Tudor homes. Overall, the simplicityof the Bader House's half-timbered stucco adds to the elegance to this classic building. (15)The interior of the Bader House has an ambiance of comfortable luxury. The materials and craftsmanship throughout are exceptional. The use of Italian tile and marble in both building and garden add great beauty to the home. The marble is particularly striking in the ballroom, with its deep red-brown tiles alternating with white in a checkerboard pattern. Tile floors grace the front and rear vestibules, and the front and side porchs. The oak floors throughout the house are typical of the finest homes of the era. Golden oak and rich mahogany paneling is found throughout the building, and is most striking in the main entrance hall, the dining room, and the upstairs hall. Wide, heavy, window frames of oak or mahogany add great elegance to the windows. One of the most striking details of the house is the large tripartate window at the top of the main staircase. The heavily framed windows overlook the garden at the rear of the house, and are highlighted by small fleurs-de-lis at the cross joints of their white metal leading. The massive stone fireplaces in the basement and living room are reminiscent of the grandest of Tudor buildings, as is the overall luxury of the home. Nearly all of the original light fixtures are in place throughout the house, and represent a high quality of craftsmanship and materials. The large scale of the ballroom, living room and master bedroom increase the feeling of luxury characteristic of the great homes of England. The golden wallcovering, bronze light fixtures, and the rich oak paneling of the sun room add to the luxury of the house. The formal elegance of the house, however, does not distract from its comfort. It is a superbly designed and Grafted house in the Tudor style, and it is a home conducive to family living. conducted by Karen Zisman January 18, 1989, and by James W.
upon the Pate interview and records. 3: Applied using a buttermilk technique. Sanders, by Karen Zisman, January, 1989.
collection of the Oregon Historical Society. 10: "Louis J. Bader Rites Set Tuesday," The Oregon Journal. November, 13, 1950, page 5 *. 15: HcAlester, Virginia & Lee, A Field Guide To American Homes. New York, Alfred A. Knopf, 1985, pages 355-58. 18: City of Portland Historic Resources Inventory, 1984.
dies", The Oregon Journal. March 28, 1978, page 24:1. Obituary of George Otten (junior). business in Portland some years before the Bader house was built. designer of the Bader Garden. The Oregon Journal. February 19, 1954, page 4 *** . Otten Jr.: "Landscape architect ,...", op. cit. Bader: "Louis J. Bader Rites ...", op. cit. The Oregon Journal. October 31, 1939, page 12. 25: Survey conducted by James W. Fiscus, March, 1989.